Historically difficult to observe, this little understood region responds both to terrestrial weather in the lower atmosphere below and the tumult of space weather from above. And it responds rapidly too, undergoing dramatic change in as little as an hour, Eastes said. Big events in the lower atmosphere, like hurricanes or tsunamis, create waves that can travel all the way up to this interface to space, changing wind patterns and causing disruptions. On the opposite side, from above this region, flurries of energized particles and solar storms carry electric and magnetic fields and have the potential to disrupt Earth’s space environment. This combination of factors makes it difficult to predict changes in the ionosphere—and these changes can have a big impact. “Space isn’t just the home of astronauts and satellites; it affects our day-to-day lives,” said Sarah Jones, GOLD mission scientist at NASA’s Goddard Space Flight Center in Greenbelt, Maryland. Low-Earth orbiting satellites—including the International Space Station—fly through the ionosphere. But communication signals, like radio waves and signals that make our GPS systems work, also travel through this region, and sudden changes can distort them or even cut them off completely. GOLD seeks to understand what drives change in this critical region. Resulting data will improve forecasting models of the space weather events that can impact life on Earth, as well as satellites and astronauts in space. 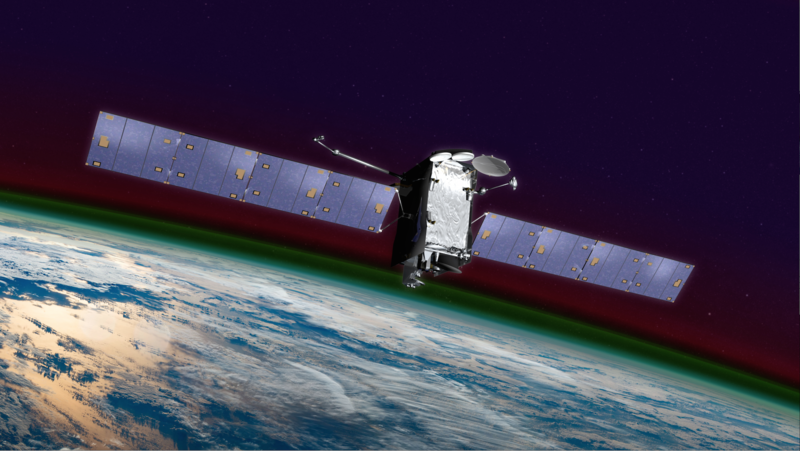 GOLD is the first mission that can provide us with observations fast enough to monitor the details of regular, hour-by-hour changes in the ionosphere—not just its overarching climate. Roughly the size of a mini fridge, the 80-pound GOLD instrument is an imaging spectrograph, an instrument that breaks light down into its component wavelengths and measures their intensities. Specifically, it measures far ultraviolet light, creating full-disk ultraviolet images of Earth from its geostationary vantage point above the Western Hemisphere. “Just like an infrared camera allows you to see how temperatures change with different colors, GOLD images ultraviolet light to provide a map of the Earth that reveals how temperature and atmospheric composition change by location,” Eastes said. GOLD is a NASA mission of opportunity led by the University of Central Florida. LASP built the instrument, and provides project management and systems engineering, as well as instrument operations for the GOLD mission. A payload hosted on an otherwise unrelated satellite, the GOLD instrument flies in geostationary orbit on a commercial communications satellite, SES-14, built by Airbus for Luxembourg-based satellite operator, SES. Also launching this year is the Ionospheric Connection Explorer, or ICON, which will study the ionosphere and neutral upper atmosphere. But while GOLD flies in geostationary orbit 22,000 miles above the Western Hemisphere, ICON flies just 350 miles above Earth, where it can gather close-up images of this region. Together, these missions provide the most comprehensive ionosphere observations we’ve ever had, enabling a deeper understanding of how our planet interacts with space. GOLD is the newest addition to NASA’s fleet of Heliophysics missions. NASA Heliophysics missions study a vast interconnected system from the Sun to the space surrounding Earth and other planets, and to the farthest limits of the Sun’s constantly flowing stream of solar wind. GOLD’s observations will provide key information about how Earth’s upper atmosphere is connected to this dynamic and complex system.